Once in awhile, the European Union produces papers that are worth reading. Boring and bureaucratic, sure, but good inspiration for those out there who are working for bike advocacy and general improvements in urban transport. 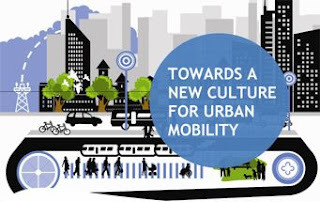 "Towards a new culture for urban mobility” is the title of the European Commission's new Green Paper on urban transport. It was adopted on 25 September 2007 and opens a debate on the key issues of urban mobility: free-flowing and greener towns and cities, smarter urban mobility and an urban transport which is accessible, safe and secure for all European citizens. With this Green Paper the Commission wants to set a new European agenda for urban mobility, while respecting the responsibilities of local, regional and national authorities in this field. The Commission intends to facilitate the search for solutions by, for example, sharing best practices and optimising financial means. Check out the website - there are some pdf's to download and there is some good inspiration to be had. This link is a direct jump to the English version of the html document. Especially American advocates of better urban transport should be pleased. As far as we can see, it is rare that such a study would see the light of day on that side of the pond. So please feel free to harvest every shred of inspiration from the paper.